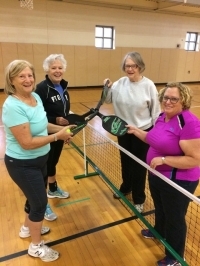 Judy Hauser, Mimi Hargate, Bonnie Bolitho and Peg Zitzner play pickleball at the CH Recreation Center. Cleveland Heights has a pickleball program, which started in the winter of 2016. One of the fastest growing sports in the U.S, and popular in China, Costa Rica, Spain and Japan, pickleball is played on a court half the size of a tennis court (making it easier on the knees), using a paddle that looks like a large pingpong paddle, and a hard plastic ball with holes. In Cleveland Heights, participants play outside in good weather, at Dennison Park’s two courts, and inside from October through May, at the Cleveland Heights Community Center (1 Monticello Blvd. ), where there are three courts. Pickleball is for singles or doubles, though most play doubles. Court time at the community center is available Tuesdays and Thursdays, 9 a.m. to noon. Fees for Cleveland Heights residents are $3 per session or $25 for 10 sessions; nonresident fees are $6 per session or $50 for 10 sessions. Participants aren’t required to play for the entire three hours—they can drop in as their schedules permit. Paddles are available for new players, as are instructors to help get newcomers started with games or drills. Just sign in at the main desk, and get started. For more information, e-mail judy.hauser2988@gmail.com. Cleveland Heights resident Judith Hauser is a pickleball player and facilitator.